Fast-forward to 2006. That blog had grown to become an integral part our marketing mix and was directly responsible for a high percentage of our inbound leads. We learned quickly that those ‘blog leads’ were typically higher quality leads than those that we generated from other vehicles. The company had evolved from viewing the blog as something we were ‘experimenting with’ to a critical component of our brand. It positioned us as thought leaders and allowed us to tell our story in a way that attracted buyers and nurture relationships with our prospects and customers. I was reminded of my first blog story several times while developing the content for the eBook we released this morning, “The Social Marketing Funnel: Driving Business Value with Social Marketing”. Although social media is no longer seen as a fad, many companies still struggle with how to participate in it and generate meaningful results. While companies’ social media understanding has evolved from ‘should we be on social media? ‘ to ‘How can we improve our social media activities?‘, brands still grapple with the key question of the value of social media. That simple question of value transcends company size, industry and focus. Our team at Awareness realized that while social is still evolving as an industry, we don’t simply need new processes, how-to’s and a set of measures – our industry needs a new decision framework. A framework that offers companies a scalable way to think about and participate in social, allocate resources, and measure the impact to their bottom line. 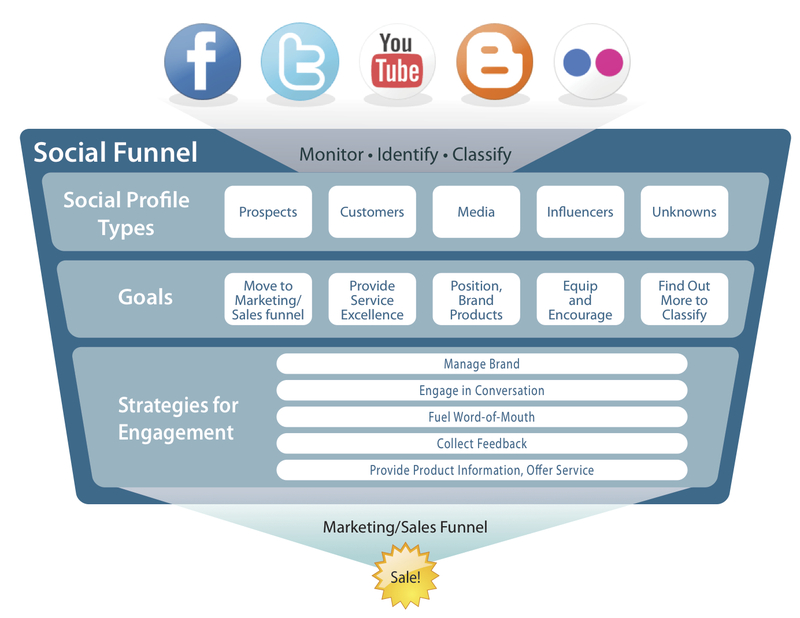 The Social Marketing Funnel sits atop and alongside the traditional sales and marketing funnel and serves as a way to nurture buyers throughout their lifecycle. By utilizing and understanding the Social Marketing Funnel, brands are able to identify demand before buyers enter the traditional sales funnel. They are also able to better manage their relationship with buyers throughout the buying process and customer lifecycle. Social Reach Velocity: gauging a brand’s ability to attract new social profiles across social media platforms over time. Social Reach-to-Traditional Lead Ratio: measuring a brand’s ability to move social profiles into your traditional marketing funnel. Social Profile-to-Sales Ratio: tracking social profiles that turn into customers over time. Share of Social Conversations: measuring a brand’s ability to dominate social conversations. I’d like to personally thank all the individuals who participated in this research for their time, their insight and their overall willingness to help with this project including David Meerman Scott, Jason Falls, Jeremiah Owyang, Nathaniel Perez, Erik Qualman, David Berkowitz, Paul Gillin, Christine Major, Jonas Nielsen, Justin Holmerud, and Andrew Patterson. We hope you enjoy the findings of this book and we are looking forward to your feedback and comments.